Many years ago, I had this as an appetizer during lunch at a restaurant near Toulouse/France. I liked it, so I asked the chef-owner what the ingredients were. He rattled off the list, no amounts or proportions. After lunch (with ample amounts of wine), I wrote down the list as I remembered it. I tried to recreate the recipe at home, and I was quite pleased wit the result. I realized afterwards that I had made one mistake. I had scribbled down "poisson fumé" (smoked fish) instead of "fumet de poisson" (fish stock). Not exactly the same! But I actually like my coulis even better! The coulis can be made a day ahead. Left-over coulis keeps up to a week in the refrigerator. 4 ripe avocados. This is one per person - if that is too much, make half the recipe. If the fruit lightly (!) yields to gentle pressure in the palm of your hand, it is ready to be peeled. Do not use over-ripe avocados!! 500 grams (2½ cups = 1 pound) raspberries. I buy frozen crushed raspberries - much less expensive! Do not use raspberry jam/confiture as a substitute! The coulis will be much too sweet. Do not use store-bought coulis. It is basically garbage, but may be OK as ice cream topping. I use smoked mackerel; the filets have soft belly areas where you can easily scrape off the meat - no need to puree. alternatively: 1-2 tablespoons (smoked) fish stock, or veal stock, or chicken, or duck stock; as with all stock, use home made if you can - it is not that difficult to make. In a pinch, you can use "fumet de poisson" fish stock in powdered form. Make sure to get good quality powder: check the list of ingredients on the package for high fish content - at least 20% - and no glutamate; I found Knorr brand to be OK.
strain through a fine wire-mesh kitchen sieve to remove the seeds. This takes at least 15 minutes of work! Scrape the berries through the sieve with a (wooden) spatula or large spoon. Don't forget to scrape the outside of the sieve once in a while. over very low heat (you should use a regular heat diffuser/distributor between the pot and the gas burner), reduce the coulis to the desired consistency. This may take at least 1 hour. Stir once in a while. do not cover the pot, otherwise the sauce can't boil down. As raspberry stains are hard to remove, you may want to partially cover the pot with a splash screen. cut the avocado lengthwise around the seed. Rotate the halves to separate. Remove the seed by sliding the tip of a spoon gently underneath and lifting out. The other common seed-extraction technique - stabbing the seed with a knife - can be dangerous, so I should not recommend it. peel the fruit by placing the cut side down and removing the skin with a knife or your fingers, or simply scoop out the avocado meat with a spoon. keep the avocado halves in one piece, don't bugger them up! if you peel the avocados more than 30 minutes before serving, put the peeled halves back into their skin - with the seed! Otherwise the avocado will turn brown. You can also lightly rub the halves with some some lemon juice. the coulis must be served rather warm! 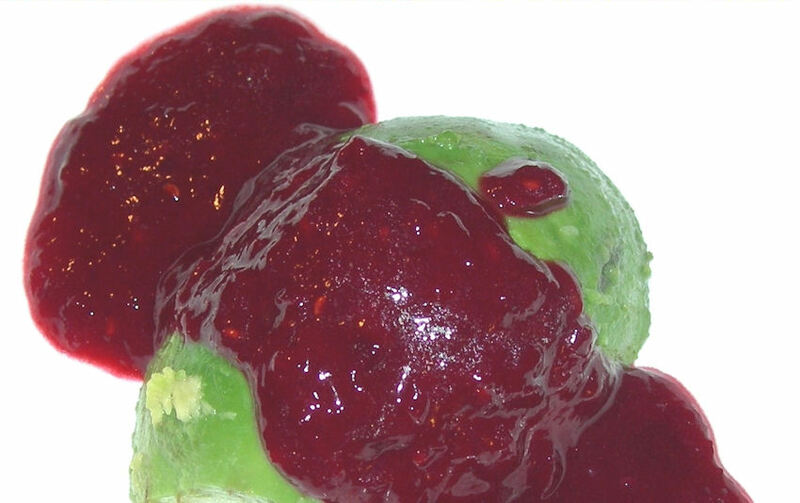 do not put the coulis on the avocados until just before serving!